August is typically the hottest month of the year, making it the ultimate ambassador of summer. It’s the month when the sun settles in and pushes away the cares of the world. Lazy, cool mornings greet us when we wake, mid-afternoons involve hammocks and swimming and our nights are filled with mild-mannered temperatures, accented by the scent of BBQ and a hint of laughter and conversation. It’s a few weeks of heaven on earth, reserved for those who are willing to let themselves enjoy it. But, even if you are the type that chases the endless summer, there is no way to stave off the impending dismay that is the ‘back to school’ season. As joyous a feeling that the end of school brings, equal is the dread that blankets all who must attend a new semester of thought provoking academia. It is September that plagues those who are trapped into a new season of school, whether it be compulsory or for some higher goal of learning. It is September that teases us in those first weeks with fine weather and last minute jaunts to places unknown. Because, as September moves on through the weeks, school looms with its books and its teachers and its cafeteria food. But, back-to-school doesn’t have to mean back-to-sorrow. Just as with everything else, as one adventure ends, a new adventure begins. The key to getting back to school is to make sure that you or your student have a reason to enjoy the new endeavor. Don’t think about the endless amount of homework or the boring class and stuffy teachers. Instead, think about ways that will make your experience more enjoyable. You could invest in a new backpack or briefcase, you could invest in new school clothing promise yourself a special treat a few times a week at the new bakery that opened up around the corner. 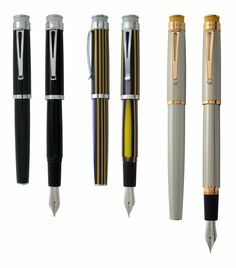 Or, you could invest in a new fountain pen that is fun, exciting, stylish and makes you feel like learning might not be that bad. Or perhaps you would like to try something from Retro 51. For under $20 you can get yourself a stylish rollerball pen in a number of colors from their Tornado series. These pens have a great shape and feel that will keep the student in you studying all night long.There are many pens that might suit your fancy in the Executive Essentials catalog, but to get you started you should take a look at something by Lamy. Lamy has a great array of pens in a number of price ranges. Take a peek at the Lamy Dialog Ballpoint pen. A space-age looking instrument that goes great with that science class. Don’t like pens? Then get a new Rotring pencil. These mechanical pencils have what it takes to get massive amounts of writing done all while keeping a consistent, tight line on the paper. Especially perfect for those long math problems that always seem to crop up at the beginning of the year.If you want to turn heads with something unique then check out Tombow. Their Zoom 707 pens come in under $20 and are sure to turn heads. With their ultra thin barrels and large grips, they will be a sure conversation starter with your new classmates. Also on our list of must have writing instruments are those from Monteverde, especially the Poquito. These tiny powerhouses may be small, but they have a lot of ink when it comes to marathon studying sessions and cramming for tests. Don’t let the size fool you – the price is right. So as always, get over to the Executive Essentials catalog and get acquainted with some fine writing instruments for the new year!